Please contact us with the contact form to report difficulties, strange behaviors or persistent problems, and quote the program name or the number 22873 . An easy-to-use and powerful tool for creating animated GIF images.You can easily create your animated banners, buttons, pictures, and even cartoons. 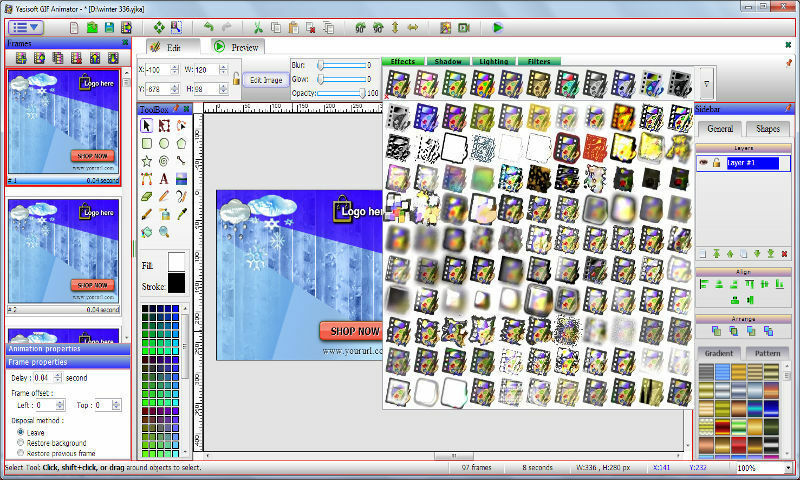 With the powerful built-in Image Editor, you don't need Photoshop, Gimp or any other editor. This is the download page for Yasisoft GIF Animator - Yasisoft GIF Animator is an easy-to-use and powerful tool for creating animated GIF images.You can easily create your animated banners, buttons, pictures, and even cartoons.With the powerful built-in Image Editor, you don't need Photoshop, Gimp or any other editor. Some editing tools: Drawing shapes Tools, Transform Tool, Edit Path Tool, Text Tool, Brush Tool, Spray Tool, Image Effects and so on.